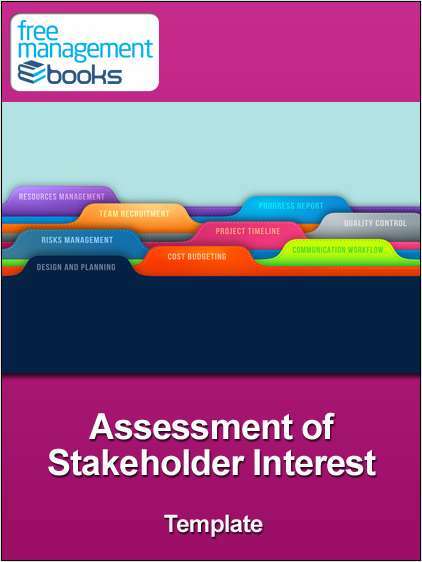 "Assessment of Stakeholder Interest Template"
Free Best Practices: "Assessment of Stakeholder Interest Template"
This stakeholder interest template enables you evaluate who needs to involved in your project and identify your key stakeholders. Once this information has been collected, the project manager can decide the most appropriate level of participation and what role each stakeholder should play as part of the planning, development, implementation and acceptance. Such analysis will highlight any issues, problems or barrier that may exist between stakeholders. By downloading this eBook you are opting in to the Free Management eBooks newsletter where you will stay up to date with the free eBooks added each month.